I was born in Lubbock. When I was around 3 years old, the family moved to Albuquerque. That’s where I grew up. But we always went ‘back home’, as my parents said, for Christmas. It wasn’t until after I was grown and married that I spent a Christmas in Albuquerque. 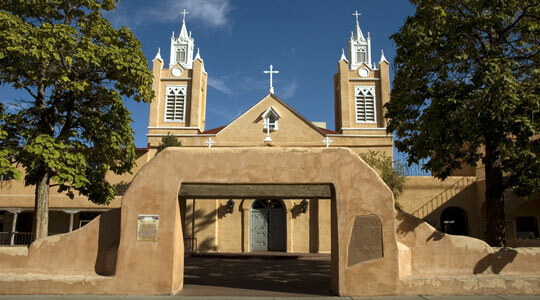 Albuquerque is the largest city in New Mexico and probably at least half of the population of the state lives there. It’s a pretty place. The Sandia Mountains run along the east side of the city, and the Rio Grande River flows through the city, from north to south. The town was originally built in a traditional Spanish village pattern. There is a plaza, located centrally and surrounded by buildings. The buildings were mostly government, then, but now are shops. Then there are homes, and a church. This area has been restored and preserved and is open to the public. It is referred to as "Old Town." The church was constructed in 1793. The church is still open and has regular services for parishioners and visitors. Every year there is a Luminaria Tour in that area of town. Luminarias are part of a southwestern tradition. They started around the 1500s, when bonfires were lit along roadways to light the way to midnight mass. They were lit to commemorate the journey of Mary and Joseph as they found their way to the stable. They celebrate the birth of Christ. In the 1800s, people discovered it was easier to use a small paper bag rather than start bonfires. And the luminaria as we know it was born. 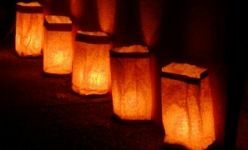 It’s easy to make a luminaria. It starts as a brown paper bag, a lunch sack size. The bag is folded down at the top. Then sand is put in to anchor the bag so it won’t blow around. It also holds a small candle that is placed inside the bag. The candles are lit and a peaceful glow emits through the bag. I’ve seen them now, stuck over Christmas lights or made of white sacks with colored bulbs. 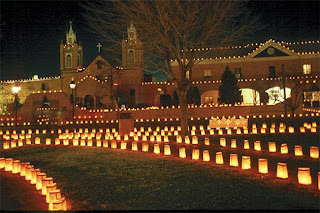 All are pretty, but nothing beats the beauty of the traditional luminaria. When you go on the tour you can walk or drive your car, or you can ride a bus. We chose to ride the bus because it’s the easiest and it’s fun because we could all be together. That Christmas we got tickets and headed out for the tour. All of the lights are off, and the bus travels around 5 or 10 miles per hour. It’s warm and fairly comfortable and enjoyable. That night, we were all together on one bus. We had an energetic bus driver who started carol singing on the bus. That’s when the kids found out their dad is really a funny fellow. The other day I asked them if they remembered the time dad sang “Blue Christmas” on the luminaria tour. They did. I could tell you the story, but Bryce wrote out his memory for me. He did such a great job I’ll share. “I was in my Beavis and Butthead phase (thought still in single-digit age, I think) when during an Albuquerque family Christmas, the family decided to get tickets to the Christmas lights/Luminaria tour through the city. This was something I'd wanted to see for most of my life to that point so I was very excited to go. But once we boarded the bus, I was disappointed. 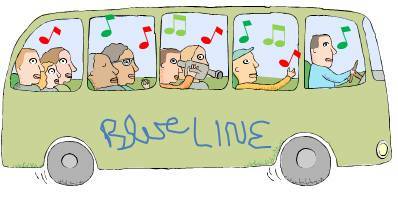 This was because I had to take a seat near the back where instead of being arranged in rows, the seats were arranged against the wall, looking out across the bus...like the rental-car shuttle van that most companies use at airports. Just like how kids want to sit as close to the television as possible, I wanted my face as close to the window as possible and it was uncomfortable to contort myself in those seats. Maybe I was older than single digits...maybe I'd already hit my 4th grade fat stage...either way, I wasn't comfortable. The neighborhoods participating in the light tour are in different parts of town so to keep interest and spirits up while driving between locations, the tour guide on the bus led the whole bus in singing Christmas carols. Now, when you really think about it, there are only about 10 Christmas carols that the majority of the population knows by heart. We made it through the first verse of the old standards like "Rudolph, The Red-Nosed Reindeer" and "Jingle Bells" but the more intricate songs escaped us. On this bus, we couldn't finished "The 12 Days of Christmas" because things fell apart when the dancing ladies threw a laying geese at a leaping lord or something. The silent night was getting longer and spirits were slumping when Elvis broke into the opening bars of "Blue Christmas" with excellent accompaniment on the harmony. Yes, Alan belted out Blue Christmas. And he did a good job! I’m not sure how much the song boosted the other riders' spirits, but it was fun and a good memory. And I may or may not know who sang the harmony! December is winding down and when it ends it will be the end of the third strip! It’s kind of weird because this strip seems to be shorter than the other ones. I really haven’t measured, but just looking at them or maybe the feel of this one in particular makes me think so. Day 261, December 17, I go ahead and go to work. They get out early and it always irks me to give a full day up while they only work a little over half, if that much. I’m antsy, though, and ready to get out of there. It’s like a ghost building anyway. There aren’t many people in at all. I chose a turquoise and gray wool that I used as the fat part on a scribble lace. Day 262, December 18, I wake up ready to go. I’m ambitious and thinking positive that I’ll get everything done before Friday. I choose a bright multi color fun fur. It’s all colors going everywhere. That’s how I’ll be until next week. It’s December 19, day 263. I got a lot done yesterday and I’m determined to get even more done today. I have a basket of yarn I used for Christmas scarves beside me and a red, green and white Christmas yarn keeps calling me! It reminds me that there’s just a few days to go. Day 264, December 20 and it’s another busy day. I hate the rush and crowds. I only had 364 days to think about this. But it’s just like it always is. But I’m going to make it. I choose blue ribbon I know because of the funny story I’m thinking. But it’s fitting too. It’s a blue ribbon for the prize of getting everything ready! I just don’t have anyone to give it to me! But I’m pretty sure I’m doing all right. You? Love that story of the carols on the bus! It's things like that that make great Christmas memories. And the luminaras are just beautiful! 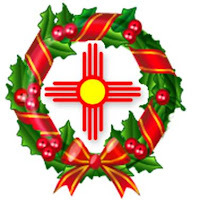 I lived in New Mexico years ago for six years, four in Albuquerque, and two in Moriarty. It was beautiful, and it never got old with me. 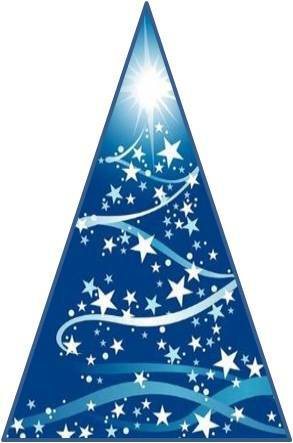 L.o.v.e the Blue Christmas story!!! Quirky things make the best memories. @Sinéad...the kids still talk about it! @Pam...you know what I'm talking about Pam. There are some beautiful things there.